Though this blog is dedicated for Mini militia, this post will be featuring another trending game in India. It's none other than the ultimate game which is creating for MS Dhoni The Untold Story Movie. Yeah! It's an android which is developed for our Ultimate Cricket Star Mahendra Singh Dhoni. I am sure that you will love to play this game if you are a die hard fan of MS Dhoni. This post will be an overview of MS Dhoni's cricket game along with it's game play videos. Replay the ball on which you got hit! The player profile option which lets you know your performance in the game. Right from your rank, win/ loss ratio, total runs you score, total number of wickets and much more can be tracked. As a captain set up the team players as per your wish. What all you find in MS Dhoni cricket game? 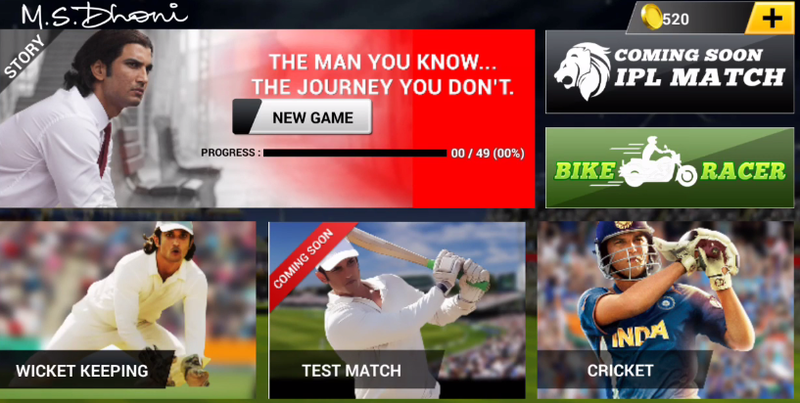 Story mode is a new addition in the MS Dhoni Cricket games version 4.4.6. It basically features Dhoni's most important games in his career. Say T20 world cup final is one of the biggest milestone of MS Dhoni. You will be starting the game from the score when Dhoni enters the field. The controls of this game are quite simple and easy. One can find the two major options for the type of shot at the bottom left of the screen. The options are Ground and Loft. The batsmen will drive the shot along the ground if ground is chosen. On the other hand if Loft is selected then the batsmen will hit the shot over the air. The batsmen can predict the placement of the ball in the field from the indication. Depending on it, the batsmen has to hit the ball. For batting the control is very simple. Either one can swipe in the desired direction or just tap on the anyone side of the screen. One can also easily change the difficulty of the game and the controls from the settings. Well wicket keeping is the major role of our cricket star Mahendra Singh Dhoni. This game allows you to train for wicket keeping. More the number of times you catch, more the chances of winning the game. Just tap on the wicket keeping in the homepage of the game to kick start the play. Once it loads completely you will find a timer at the top. Then a scoreboard at the top right. The bowler will start to bowl randomly in any direction. You just need to top on the direction which the ball is bowled. Watch the below video for experiencing the game play. We all know that Dhoni is crazy over bike. Everytime one wins Bike for Best man of the Match, Dhoni is the one who drives it ;) Hope you all remember those golden days :) Well coming to the game. Bike racing is that the one which you expect. It's just a simple game where you just need to SHIFT the gear in appropriate time to win the race. Watch out the game play from the below video. Well that's it about the game. Hope you enjoyed reading it. Indian Cricket history has many legends with the tremendous records of achievements. Cricketing fans have been celebrating their heart breakers with various sessions of their time travel. After Master blaster Sachin Tendulkar, Mahendra Singh Dhoni is the not only a name is more than an emotion for majority of cricket fans round the globe. Past of this young talented cricketer has lots of difficulties and with enormous speed breakers with the pinned with the politics behind Cricket in India. From a most unpopular city in India, this boy from a small town Ranchi, is now being celebrated as the most popular successful sportsman with almost majority for the Cricketing Legends praises. As a history the story of each successful personality, there are many untold terrible sensational Past. Dhoni’s initial career was not a cricketer but was an all-rounder who excelled in many sports, which adds on with badminton followed by football, he was not just only a player his recognition with his star performance and also has represented many District Level Matches. Sudden U-turn in his career was initially stipulated Goalkeeper and was deviated by Football coach as he recommended to play cricket for a local body club. Dhoni was not a trained cricketer, nor a professional Wicket Keeper, but It was his practical intelligence, implemented his Ethics in Goal Keeping into Wicket Keeping and was also successful in his career too. Started his Cricket Session in a unique was this body with his inborn cricketing Talent and adaptability became a regular professional cricketer and also was impressed the dignities gathered around over. With his striking performances with the Cricket Club, he was one among the brunches for the Vinoo Mankad Trophy Under 16 Championship. This talented character has to travel miles in a two sided path not for his survival for his father’s Satisfaction. Though he was a professionally Turned Cricketer, His Father wanted to see him as a Government Officers and wanted to see his as a renowned person who leads his life peacefully. With his Cricketing career in a positive approach, Dhoni impressed the Railway Official Head and with his Father’s recommendation ad was appointed as Travelling Ticket Examiner at Kharagpur Station for about three years. His 24 Hours session majorly fulfilled with travels from the railway station to cricket Ground. Dhoni has many compromises with his job and never let his dreams to sleep. He was a honest, true sportsman and also an open minded employee who doesn’t let anything into his mind which makes him disturbs. Dhoni often remembers the offers from. Mr.Deval Sahay, who gifts him, Rs.50 for his special Sixes he hits. Dhoni’s had many rejects in this travel towards this careers East zone u-19, Bihar u19 ,Rest of India Squad, and his striking performance among his teammates were not properly recognized. His efforts of making 84 runs for his Bihar Team were, overlapped by Later Best Friend, copartner of their Partnership Player Yuvaraj Singh’s Performances. With lots of hard hitting batting averages , strong shots this guy was more intense in wicket Keeping Skills and this efforts in the 2003/2004 Session was Drilled him towards India A team for Zimbabwe and Kenya Tour. This man has probably never failed to impress made 7 catches and 4 stumping, and was a jet speed between the wickets, His speed many times were quenched many fast bowlers between the Wickets. Finalizing the tournament this was continued against Pakisthan A with back to back centuries which made National Team Selectors Towards the newly emerged Ranchi King. Though Dinesh Karthick was the choice of majority among the committee for the Bangladesh tour it was Dada’s Ideas to get this gem to the crowns of Indian Crickets. Initial Stages of his ODI careers was with disappointments scored nil in his match. He had an average tour, then he also had a second chance to get into Indian Team Against Pakisthan Tour. In the Second Match at Vizag, this guy turned the vision of every Indian with his 148 runs of just 123 deliveries, also made a record most of the runs by an Indian Wicket Keeper. In his next tour against Srilanka Dhoni has only few chances and in the third ODI by chance to start at No.3 due to early comeback of master blaster chasing a huge score. Utilizing his earlier entry stirred his skills off to turn head rise Up with 183 not out of just 145 balls made India Towards one of the historical Win. With his tour, Dhoni made a strong foundation in the Indian Cricket with number of records in the series the highest run scorer with a total of 346 runs. Inturn Dhoni was Made to climb the ladder towards B grade Contract by BCCI. Again turning of his career with the next Asian Team Pakisthan, he has some valuable contributions to the score, in the third match against Pakistan Dhoni finishes off with 72 runs of just 46 balls to take India over a lead in the series. After this curtail inning the Final Fifth ODI the decider of the Series Winner. India was in the quench to thirst the of winning a series against Pakisthan, Again this time it was Dhoni the man who finishes of with style 77 runs of just 56 balls which made India towards a historical Win of About 4-1. With his consistent performance, Dhoni never failed to entertain Audiences with his master special Helicopter Shots, his strike rate majority of the times strikes above 100. With his continuous achievement beating all the internal politics inside Indian Agenda by this batting Performances was promoted to Vice Captain of India in the South Afraican Tours. Thrown away in the first round of 2007 World Cup. Indian Team had to face lots of criticism from the fans of India. As T20 World Cups were announced for the First time, with a scope of surprise all-over BCCI announced a young Cricket Team under Dhoni’s Captaincy. Not only Fans many legends were surprised with the official announced this young team was calculated to be one of the weakest team by the many teams among the participants. With lots of under estimations this young teams was enriched by Dhoni’s Motivations. Promising Partnership from Dhoni- Yuvraj Singh Combo made Indian Team Towars the Finals of World T20 First World Cups. Adding a bow to the expectations it was the Other Asian Team Pakisthan Who was into the Finals. This match has lots of surprises. Dhoni and team answered all the critics round the globe with their remarkable perfrmances towards the Finals. In the Finals India has to defend a little easier task against Pakisthan. As it was expected to be a easier victory for Pakisthan as the popular Advertisements promotes “Experts would have asked to go with a lead spinner I had a different Idea”. Dhoni made a last minute miracle making Johinder sharma to bowl the last over to bring th First T20 World Cup. Dhoni climbed the ladder to get the Second Indian Captain and the First Captain to lead a team to with the First T20 World Cups. There started Dhoni’s magic his travel made Indian Team to reach grater records Making Indian Team to reach No.1 in Test Rankings, Won Champions Trophy, and many other trophies in the foreign Ground. Dhoni with his Master Class performances Rides a chariot of Victories and was one the successful captain for the Team India. Dhoni started his preparations for the 2011 world cups and was successful with his peculiar selections. Many Times his judgments rode India towards the successful Streak. When IPL was introduced, Dhoni was made Captain for Chennai Super Kings. He made this team to reach atleast semi finals in the consecutive tournaments and with twice the title Winners of IPL. His prediction were successful and his identifications Jadeja and Ashwinare now ruling the charts of Indian Cricket Team currrenlty. Dhoni once again made India to Lift the ODI World Cup for the second time after a very long wait of about 28 years. The Man finishes of in style made a promising innings in the finals held at Wankade Stadium, Mumabai against Sri Lanka. The Ranchi Rocket Finished the match with style stitched Indian with the joy of fulfillment. As the name Dhoni searched, it carries lot many record, lot many critics, lot many recognition, this man made Indian’s proud. MSD called by his Fans, made a new definition for cricket and made everyone to fight for T-shirt printed with number 7. Sachin Tendulkar called the Master Blaster , God of Indian Cricket, Mahendra Singh Dhoni (MSD) Can also be abbreviated as Master Sticker Dhoni as of From Now. Biopic of MSD has been released as MSD the untold Story and also has created many records in Box office collection as the same the name which created many trophies, many new cricketers to ride the Indian Cricket Team successful.